The second post I chose for my blog discussion assignment this week was, Back to School 2016 on the blog Musings from the Middle School. I decided upon this one, because Pinterest, blogs, Facebook, and Twitter are typically full of decoration, organization, and bulletin board ideas for the Elementary Classroom. 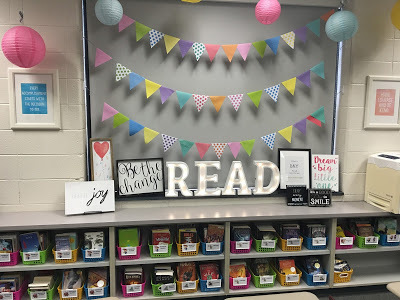 This post is directed towards the middle school classroom, Jenna Smith highlights a few key features around her classroom: Photo Display, Article of the Week, While You Were Out, Daily Agenda, Objectives Wall, Classroom Library Display, Growth Mindset Posters, What I Am Reading (teachers book), and a Book Talk List. This post shares a picture of each one of these highlighted areas and a few areas include a link to a blog post that she has written about the purpose and the how to of the specific classroom component. I love how simple and purposeful these classroom decorations and bulletin boards are! I may not be in love with the actual colors or particular theme, but I love the ideas presented and the ability to make use of the different aspects of the room to serve a function in the day to day business of a classroom. It is also very organized and am sure will handle the ability to withstand 100+ students every day!